Certainly one of my favorite singles ever, I dare say one of the greatest records ever released. Fact not opinion. 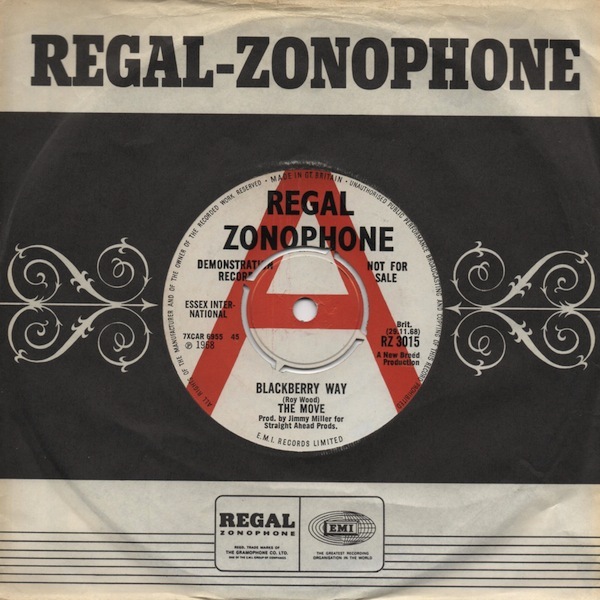 The recent BBC documentary, THE JOY OF THE SINGLE spotlighted ‘Blackberry Way’ as just that for a teenage Holly Johnson, who relived a long walk to and from a nearby record shop, whereby The Monkees’ ‘(Theme From) The Monkees’ wasn’t available. 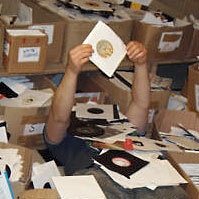 In fact, that track was never issued on a 7″ when current. 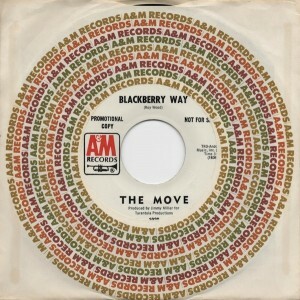 The shop clerk talked him into the latest release by The Move instead, a sale amongst many that would have contributed toward the record reaching #1 on the UK charts. 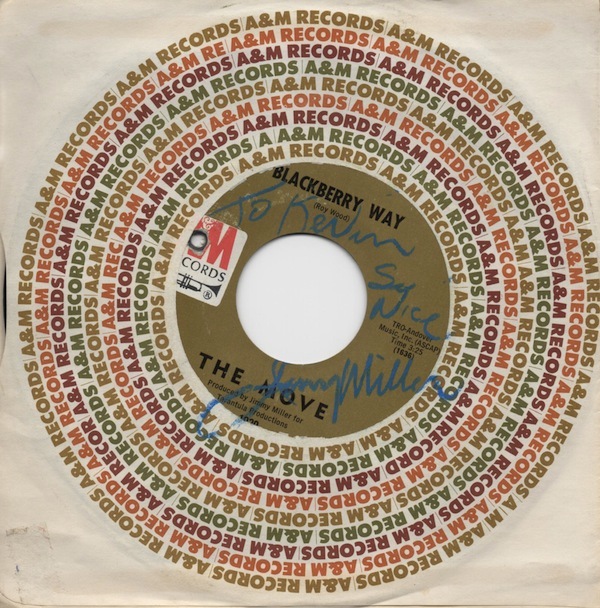 The program was another in a long list of reminders that pulling out a copy of ‘Blackberry Way’ and letting it play on repeat was yet again, a solid hour well spent in my house. Along with high school pals Denny and Mark, I sent off to England for copies of this pre-release. We wanted it shipped day one. 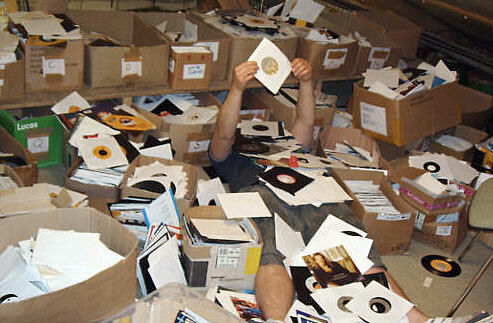 God knows how we’d hear about these records sentenced to teen life in upstate New York, but we did. In fact, our crowd were so into The Move that there was no messing about by this, the release of their sixth single. 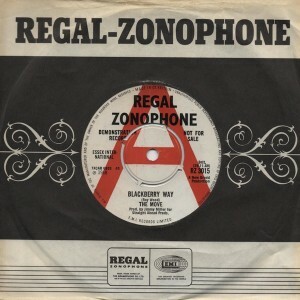 And one titled ‘Blackberry Way’, heaven help us, we knew it’d be stunning. I can vividly remember opening that cardboard mailer and playing it for the first time. Stunning doesn’t do the song justice. Years later, employed in Elektra’s A&R department meant a constant search for new signings and a resulting schedule of meetings with everyone from managers, agents, lawyers and occasionally, name UK record producers with their newest projects. Through the years Gus Dudgeon, Don Arden, Jonathan King, Stuart Colman, Malcolm McLaren, Wayne Bickerton, Hugh Padgham or Shel Talmy might book in while passing through New York. On one occasion, I got a call requesting some time for Jimmy Miller. His visit was not going to be wasted on me. 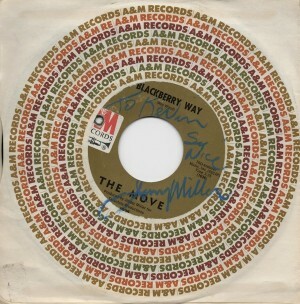 I was only too keen, as was usually the case, to talk about the less travelled topics covered by most fellow A&R reps, in this instance his more obscure British productions, of which The Move was one. Turns out, he was always happy to recount his histories, including a well repeated run down of that period with The Rolling Stones. But my curiosity in The Move brought out a unexpected tale, all presented with the enthusiasm of a kid. 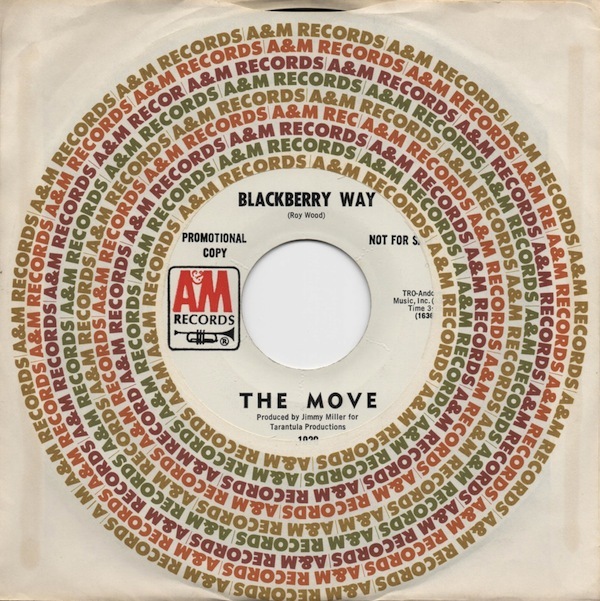 For starters, ‘Blackberry Way’ was the only song he ever recorded with them, and then just sitting in for the band’s usual producer, Denny Cordell. The details were rather simple and verify the often documented flying by the seat of their pants 60′s music industry. Denny and he were co-workers at Straight Ahead Productions, to whom The Move were signed. Denny was double booked on a session with Joe Cocker & The Grease Band and asked Jimmy to cover for him with The Move. These details, to be clear, were laughingly verified by Denny years later. As a result, the band’s only UK #1 was produced, not by the guy who worked with them on every other track prior, but by his pal in the next office. A jovial recollection actually. So as Jimmy Miller sat across from me recounting these details for the first time in my office on the 20th floor of the Warner Brothers building, I pulled out the above copy for an autograph, which seriously pleased him to no end. Abrupt false ending followed by slight reprise, non-musical sound effects, over echoed background vocals: all quickly becoming standard psychedelic production ideas by ’67/’68. Simple to observe now, but then…it was ‘pass the headphones’ stuff. 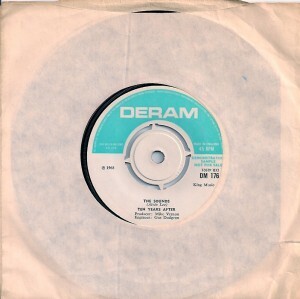 Mike Vernon, I believe signed Ten Years After to Deram prior to starting probably the best UK blues label in terms of both quality and success, Blue Horizon. I’m guessing it was this band’s original musical style that most likely drew them together. ‘The Sounds’, although recorded as a single during that short period between album one and two, and released spring ’68 (UK B side / US A side), actually marked the beginning of a unique songwriting style that blossomed fully on STONEHENGE, their third full length and first of a flawless trilogy (SSSSH and CRICKLEWOOD GREEN). 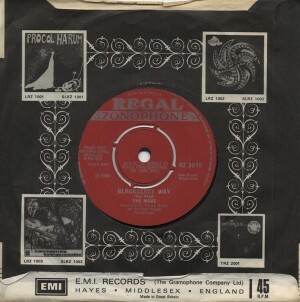 Ten Years After were about to be on a roll, due to a wildly blistering performance at Woodstock of ‘I’m Going Home’. 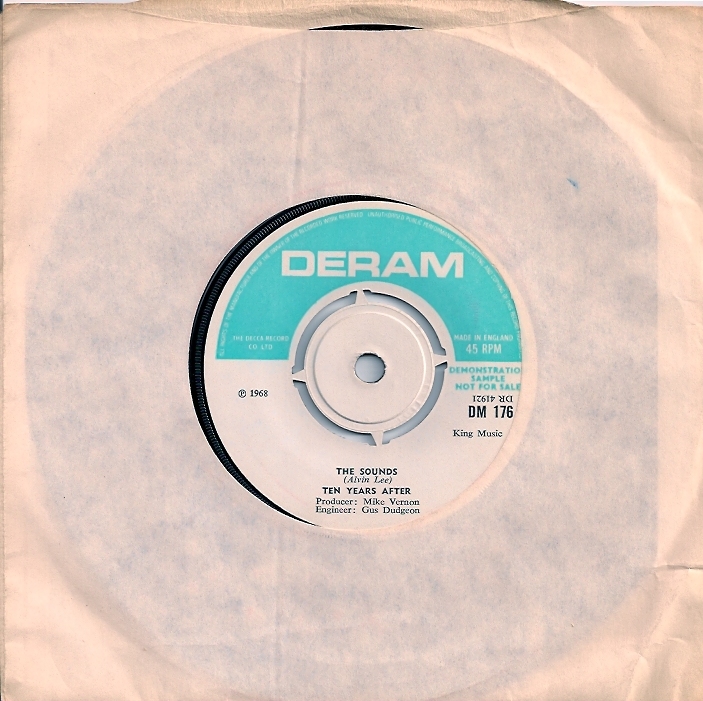 It’s original recording was released as a followup 7″ to ‘The Sounds’. 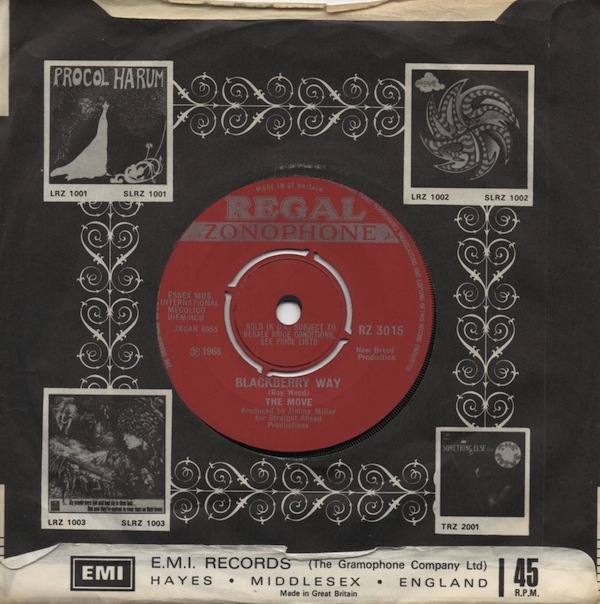 Coupled with ‘Hear Me Calling’ meant it became a classic double sider. The Woodstock version made both the film and soundtrack album, hence Ten Years After enjoyed the perfect artist development curve making those (and other albums) deservedly successful and their live draw solid for years. 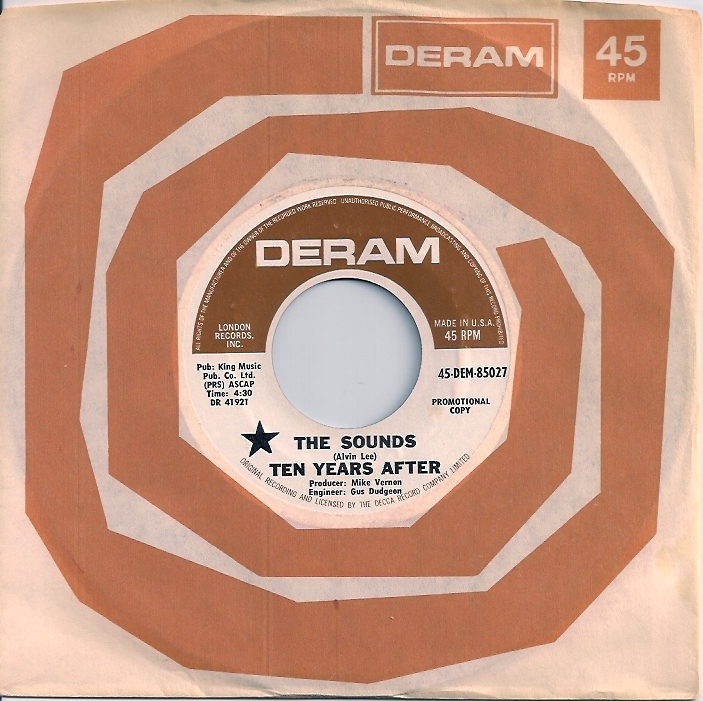 ‘The Sounds’, at time of release, could be found nowhere, and surprise surprise, heard nowhere in the US – certainly not upstate. It took me years to snag a copy, around ’74 I would guess, when then MCA salesman Ed Terracino (former London Records employee) gave me a stack of singles from his basement stash. I am forever grateful Ed if you’re reading. Never did see them play this one, and maybe they never did. It must have been around SSSSH when they made their way to Syracuse, with Humble Pie supporting. It’s was Humble Pie’s first US tour, and although nowhere near as interested in their boogie rock as the music of the member’s previous bands (The Small Faces and The Herd), I went along, being a huge Ten Years After, but also with the possibility of meeting Humble Pie as a bonus. I’ll admit, Humble Pie were surprisingly great live, still bean pole skinny, clad in lime, purple and pink velvet pants/suits and little girl blouses, America hadn’t influenced their wardrobe or haircuts yet, so it was well enjoyable. Ten Years After, on the other hand, appeared bored and sullen. No biggie – it happens. Playing Syracuse understandably nothing to look forward to I guess. Afterwards, I made my way backstage, really in search of Humble Pie to stalk them for Small Faces and Herd details, when I came across Chick Churchill moping dismissively against a wall. Probably an unpleasant day for the fellow, and I suppose me excitedly getting to the real point of our conversation: where are Humble Pie, didn’t help. Although I loved those Ten Years After albums mentioned above, he did throw a temporary wet blanket on my mission to covert any and all to his band.